With the college basketball season pretty much over, I'm running out of new venues to visit in New York City. The nascent MLS team NYCFC plays out of Yankee Stadium and I'll be going there next month, and there are some college baseball games but the weather has not been conducive to enjoying those quite yet. So each weekend, I'm heading out of the city to add to my AHL venue count, concentrating on those teams that are moving west after the season. This past weekend all of the nearby New England venues that I've yet to see (Bridgeport, Hartford, Springfield, Worcester, and Manchester) were hosting games, with some having two or even three contests to choose from, I initially planned on Hartford on Friday, Worcester on Saturday, and Manchester on Sunday, but ended up changing that slate as other factors came into play. My wife decided to accompany me, so immediately the chance for three games disappeared, with Friday's contest stricken from the schedule to make room for something called "a nice dinner". I always thought arena hot dogs and chicken tenders qualified as "nice", but let's just say I was politely told otherwise. As it turned out, it snowed on Friday (the last "storm" of the season I hope) which made getting to Hartford in time for the game impossible regardless of my intentions. We continued on to Worcester, with the 175-mile drive taking nearly five hours thanks to the snow and rush hour traffic through Connecticut, reminding me of my recent southern sojourn. After this winter, I am glad that the AHL is moving west and I can look forward to a trip in 2016 without weather worries. Worcester (it kind of rhymes with rooster depending on who is speaking) is the second-largest city in New England and known as the Heart of the Commonwealth, because of its proximity to the center of Massachusetts. As I drove through town on Saturday afternoon, I commented to my wife that I had never seen such terrible drivers. It seems like the rules of the road are merely suggestions here. At one large intersection where all four lights were flashing red (which means it should be treated as a stop sign) drivers just followed the car in front without stopping. Only when both perpendicular directions were free could you risk entering the intersection, and then every other driver would follow. Yield signs were routinely ignored; I was cut off a couple of times, and generally found many others pointlessly aggressive for such a small town. In a shopping mall parking lot we witnessed one person speeding up to yell at a minivan driver who had committed some perceived offense. Turns out that this was not a small sample size, but a reflection of Worcester actually having the worst drivers in the country. It was gratifying to know that all my road trip experience allowed me to identify them as such. 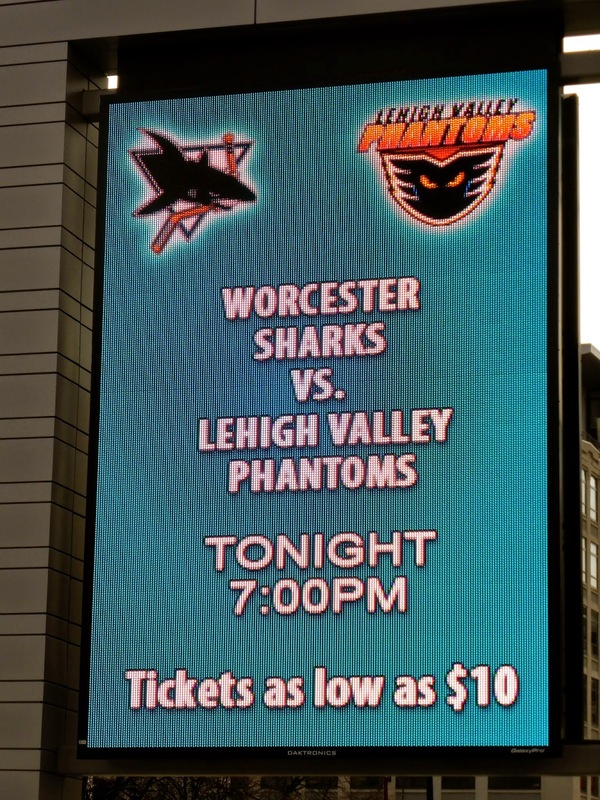 After our tour, I returning to the safety of our hotel to drop my wife off, before again braving Worcester's worst, zooming downtown to the DCU Center where the Sharks were hosting the Phantoms of Lehigh Valley. San Jose is moving their affiliate to California, where they will play in the same arena as the parent club next season. 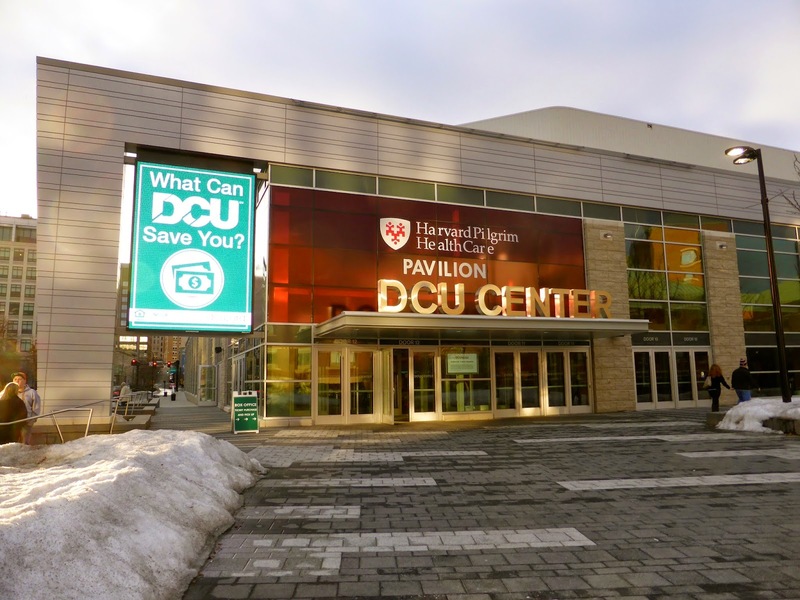 No ECHL team is replacing them, so this was one of the last chances to see a pro hockey game in the DCU Center, at least until 2017 if an arena bartender is to be believed. I arrived about an hour before game time and as I was standing in front of the arena, I heard a child ask "Where is Granny going?" The reply "She is going to see if anyone needs a ticket," was music to my ears. I scooted up and casually asked if she had an extra, and after giving me the once-over to, she handed me a ticket. Free hockey! Thanks Granny! 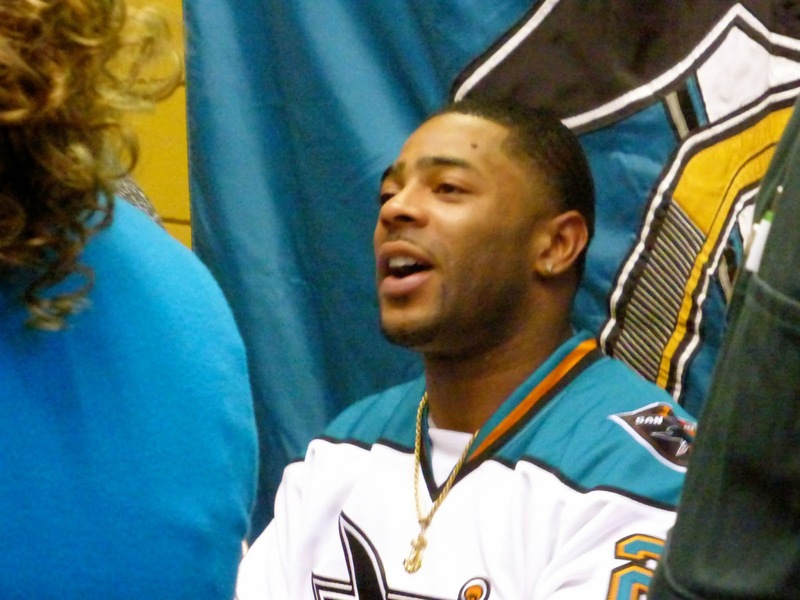 Upon entering the venue (#540 lifetime), I saw a long line of fans, many dressed in New England Patriots gear. They were all waiting to receive an autograph from Malcolm Butler, whose last-second interception sealed the Super Bowl for the Pats just over a month before. I'd say the queue snaked halfway around the concourse. I didn't bother lining up, but followed it around until I could snap a surreptitious shot (above). Butler also performed the ceremonial face-off. 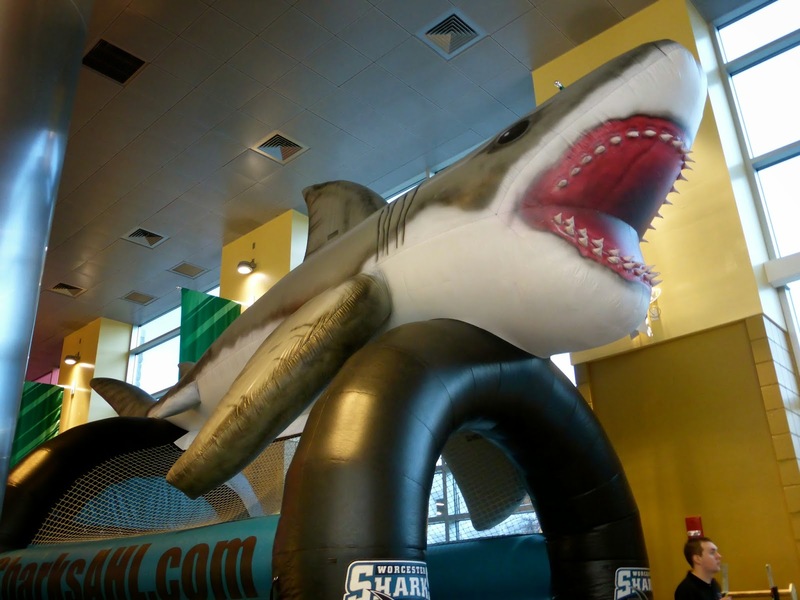 The concourse is also where you can find a large inflated shark above a game where kids can take slap shots. 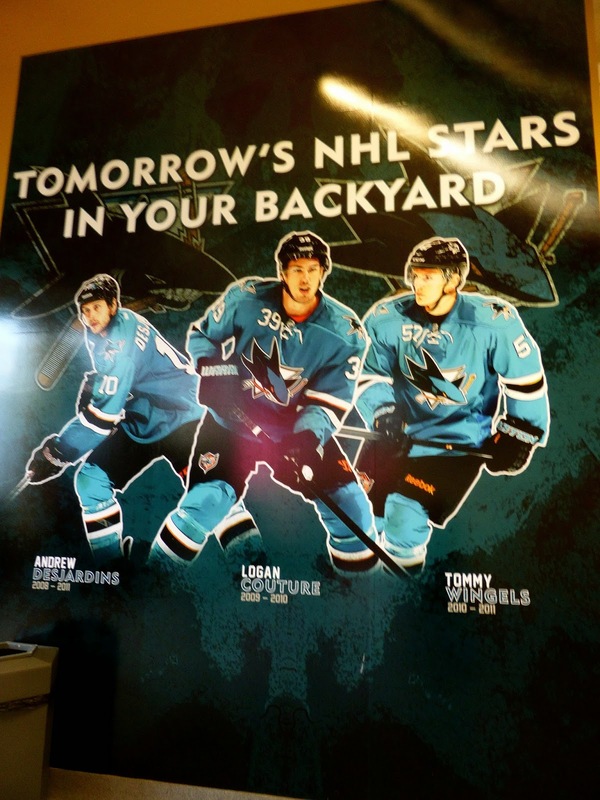 I am not sure what they will do with this after the game, but I would guess only San Jose can use it. I really liked the setup at DCU Center, with two bars on concourse level at either end of the rink that were serving decent beers at only mildly inflated prices. 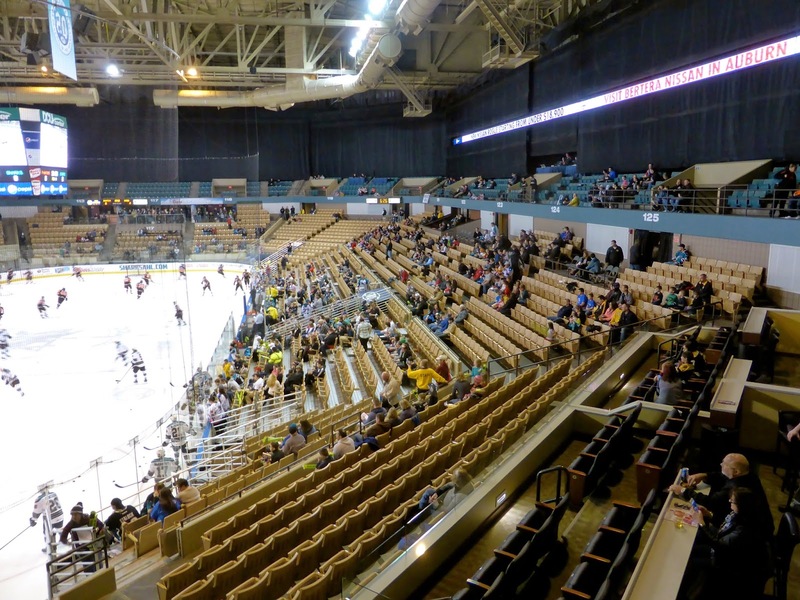 The lower bowl has about 20 rows, with the top few high enough to avoid the glass, while the upper deck has about four open rows in front of black curtains, but it provides the better view if you can avoid the railings. There are some groups of seats that rest alone on this level which give you some privacy as well as an unfettered view of the action. 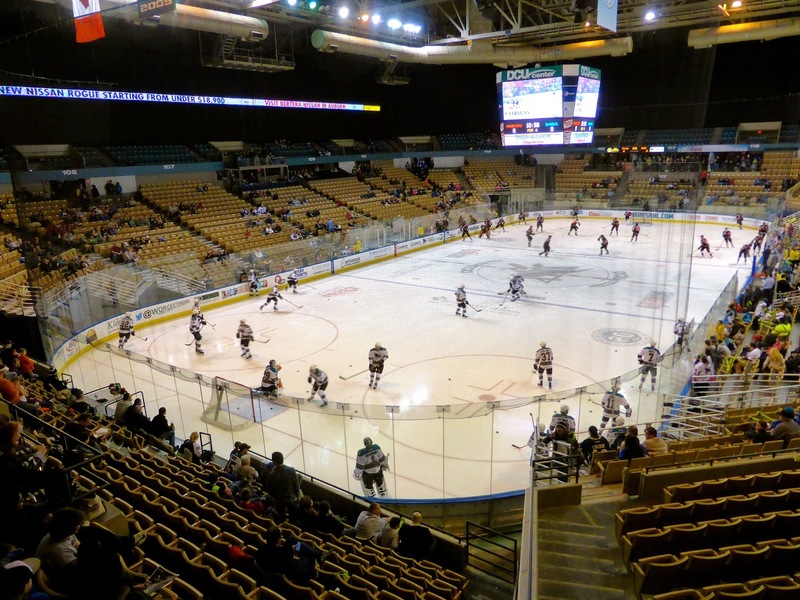 The free ticket I had received was In the corner and the DCU Center is not well designed for hockey, particularly in this area where railings block your view of one of the nets. So I went to Guest Services and asked for an upgrade. I was moved to center ice at no cost, with my new seat written directly on the ticket, something I had never experienced before. I spent the first two periods here, but the seat was not good for taking pictures, so I moved to the upper deck for the third period. 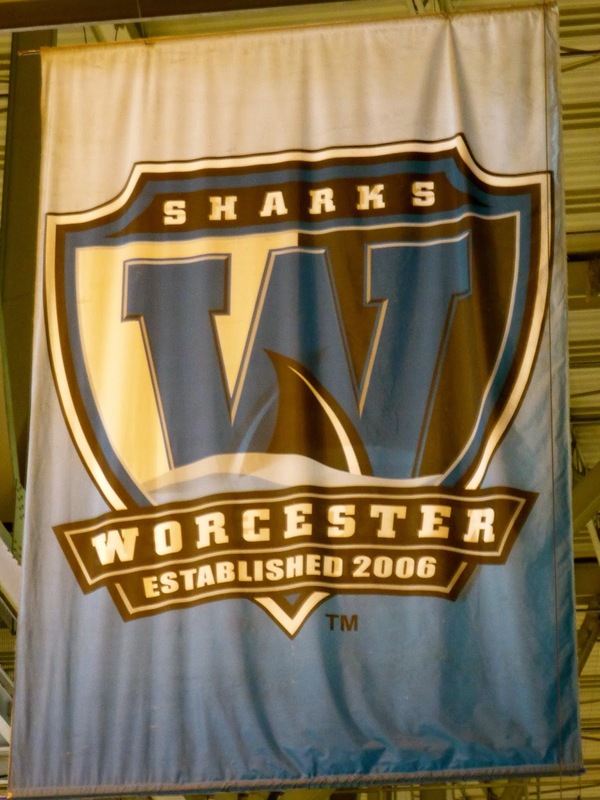 Worcester is fighting for a playoff spot and they opened the scoring five minutes in when Daniel Ciampini (above), newly signed out of defending NCAA champ Union College, potted his first pro goal, converting a perfect pass from Jimmy Bonneau. Five minutes after that, Bryan Lerg doubled the tally with his 5th in three games, netting him AHL Player of the Week honours. When Rylan Schwartz added a third after another five minutes had passed, the rout was on. 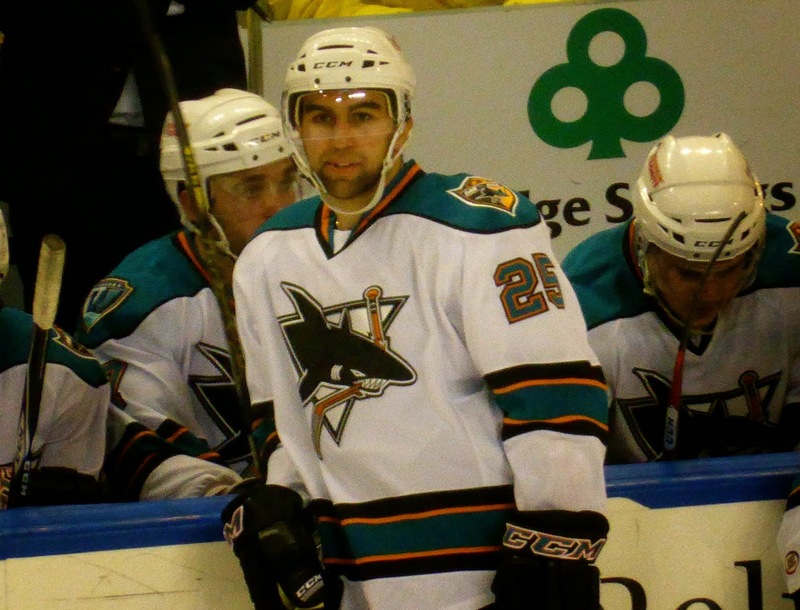 The Sharks scored twice in the second to salt the game away. 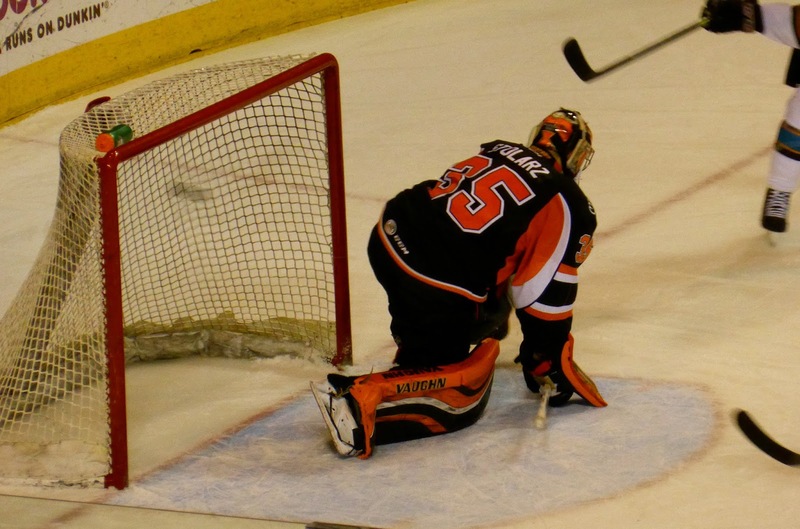 The third period saw the Worcester go two men down and Brandon Manning (above) scored a power play goal just as the 5-on-3 advantage was expired, ending Aaron Dell's shutout bid. A late goal from John McCarthy (that's the puck entering the net behind Anthony Stolarz above) made the final 6-1 Worcester. Attendance was announced at 6,131 but I'd say many of these were fans of Malcolm Butler who left before the game even started. 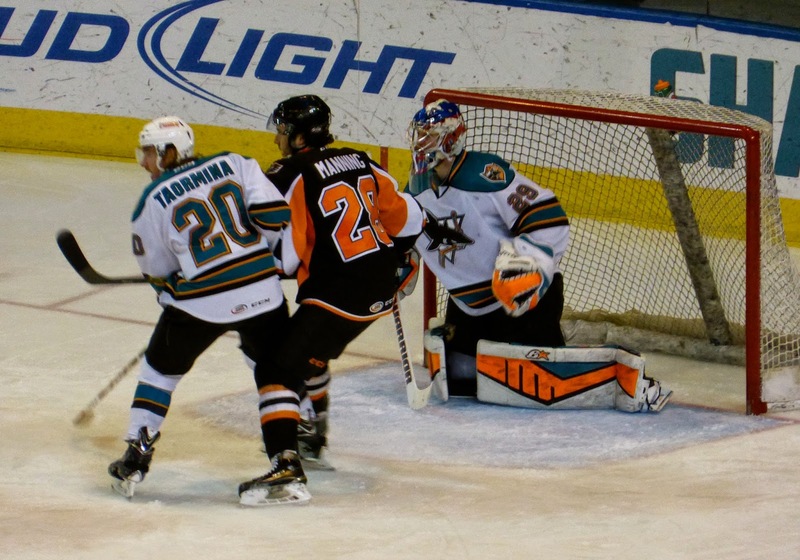 The referee was Jamie Koharski, son of long-time NHL official Don, who is most famous for having a character in Wayne's World named after him. I love how the minors turn any player who toiled there into a "star" when they make the jump. Andrew Desjardins and Tommy Wingels are solid players but not likely to make the Hall of Fame.